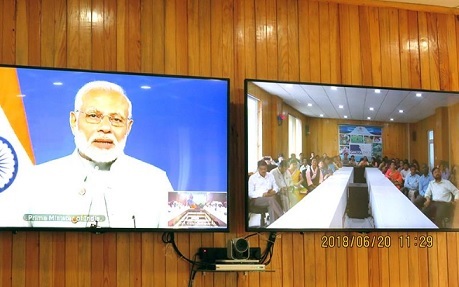 In a first of its kind, Prime Minister Narendra Modi had a direct interaction with farmers across the country on Wednesday through video conferencing. The Doordarshan, DD Kisan, Aakashvaani and Namo app broadcasted the live interaction programme with farmers. The farmers of Sikkim under ICAR-KVK- East, ICAR-NOFRI had been selected among the KVKs of the whole north-eastern region for the interaction programme. During the session, the Prime Minister interacted with the two farmers of Sikkim – Nim Tshering Lepcha of Nandok village and Pemkit Lepcha of Timpyem village of east district at NIC, Gangtok. At the outset, the Prime Minister interacted with Pemkit Lepcha, a progressive woman farmer and enquired on her on-going agricultural activities. She informed the Prime Minister that she is undertaking organic production of vegetables in rice fallow under zero tillage system. She was cultivating maize and rice in her land and earning an annual income of Rs 50,000 in an area of 0.3 hectare land before KVK intervention. After hands on training from ICAR-KVK on zero-till vegetable pea technology of ICAR-NOFRI, her income increased more than Rs two lakhs and also increased the cropping intensity to 200 per cent. The Prime Minister also interacted with Nim Tshering Lepcha and wanted to know about organic ginger production, as Sikkim is famous for organic spices production. Lepcha, informed the Prime Minister that he is practicing organic agriculture since long back from 2013 and earned Rs 1.25 lakh per year but after the hands on training from ICAR-KVK and technological intervention with ICAR-NOFRI in the year 2014, his income increased up to Rs 6.5 lakh in a year by cultivating ginger, off-season vegetables, garden pea, large cardamom, dairy, poultry, piggery and fisheries from his six acres of land through Integrated Organic Farming System (IOFS). A total of 28 farmers from the east district were present at NIC, Gangtok during the live interaction programme. The direct interaction programme was also attended by ATARI Zone-VI director A K Tripathi, ICAR-NOFRI joint director R K Avasthe and other specialists and officials of KVK and State Agriculture department. The interaction programme with web telecast was also watched by total of another 108 farmers from East Sikkim along with all scientists of ICAR-NOFRI, SMSs of KVK and all other staffs of the institute at conference hall of ICAR-NOFRI, Tadong.